The 2019 Chrysler 300 is a popular and powerful full-size sedan. 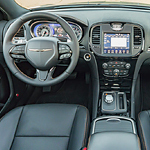 The 2019 Chrysler 300 provides drivers with a number of heart warming performance features that include an assortment of engine sizes as well as specialized all-wheel-drive systems. The 2019 Chrysler 300 equips drivers with their choice of the V6 or V8 motors. The V6 engine comes available with 3.6L of power and this setup allows the 2019 Chrysler 300 to achieve up to 30 miles per gallon on highways. Drivers who like a little more pep in their step will certainly appreciate the 5.7L HEMI V8 motor. This beast of an engine puts out 394 foot-pounds of torque backed up by 363hp. Keeping all that power coordinated can be quite a task, but the 2019 Chrysler 300 performs this job easily with its all-wheel-drive system. This system can sense road conditions and use this information to activate the all-wheel-drive system.